There are two subjects in this image. They tell separate stories, but combined, they create one story. 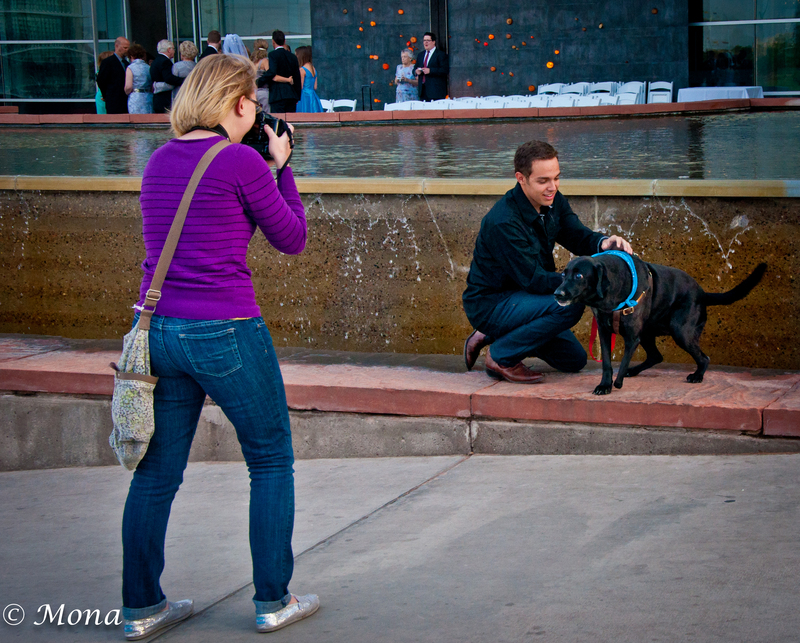 The Waterfront, a popular site for weddings and events, is located at Tempe Town Lake, a popular site for people, dogs, skateboards, and fishing poles. We witness the making of memories in this shot, as the photographer captures the love between man and his dog, and in the background, the wedding photographer creates memories of this special day for the bride and groom and their families. Me too! I find it’s much more interesting to shoot people than flowers, yet, I’m still quite timid. Yesterday, I got a little bolder. Of all the “two subject” posts I have seen, this is one of my favorites! WOW! That is really saying something. Thank you! When I saw the scene, I just had to “capture” it. I can see three stories – between the dog and the photographer…..
JIM! How delightful to see you. Yes, there is a story between the dog and the photographer. I watched them for a while and decided that the dog clearly belongs to the man, but the young woman is close to both of them. You can add in a 4th story: me in the background. The solitary watcher. Aha! THAT’s why he’s not standing still! What a great shot, telling a great story, Mona! A picture that speaks 🙂 Lovely interpretation Mona! Love this picture and the fact that all of you might not know each other but for this one picture your stories are interconnected!! Thank you. True that we do not know one another; I had not really thought of it in these terms, but I think you are right. We are all interconnected in this world in some way or another, if only for a few moments.